These building blocks are how I approach every single design I do. The layers are arranged in an organized fashion to keep me laser focused on one design task at a time while resting assured that nothing will be forgotten or overlooked. This layer addresses all the structural elements of the home, such as doors and windows, walls and ceilings, as well as cabinets, fireplaces, moldings, and more. Changing any of these elements in a home requires a lot of planning and calculating. You need to be sure that everything that is being proposed solves your problems, fits properly, and functions well. Doing this while building beauty and creativity into your design is important in every layer. Having an accurate floor plan of your space is crucial at this stage, as it allows you to work out any desired changes. Many problems can be anticipated and solved by doing this first. You can get a digital floor plan done for you here. I will create a digital plan of your existing floor plan, this is your baseline. Once we have worked out all of your specific changes, I will create two more, one with all the necessary measurements and one without. I do this, because I find it is sometimes easier to study your floor plan without the measurements getting in the way. As a bonus, I will also include a furniture space plan when you buy this service. This layer consists of compiling a collection of colors and textures into a beautiful palette for your room or entire home. What is included in your package will largely depending on your project. Included will be things like installed flooring, paint, stone, tile, wallpaper, counter tops, metals, woods, and fabrics. Basically, it is all of the surfaces of your room that you would see before you move any furnishings into it. Having a complete color palette, allows you to avoid feeling overwhelmed when you begin shopping for your exact product. Whenever I do a Color & Materials Palette I try to include exact products that can be easily purchased nationwide. Sometimes this is not possible, so I always include as much information as I can so that you can easily source a similar product. DESIGN TIP: I always encourage my clients to spread the textures they use somewhat evenly within their home, as this is what gives a home a warm cozy, cohesive feeling. The furniture pieces in your home are a big investment; it is something you don't want to purchase lightly, without careful consideration. It is best to know what you are looking for before you hit the stores, after all, these pieces are going to be with you for a long time to come. Think of your furniture as tools. They usually serve specific and multiple purposes, and they need to include precise features to help you function in your day-to-day life. Plus, since they will largely determine the traffic flow within your home; it is well worth the extra effort to plan a furniture arrangement first. There is nothing worse then spending $4000 on a sofa only to find out it should have been 6 inches or more shorter. This way you will know precisely what you need and how it fits and functions within your room before you buy it. 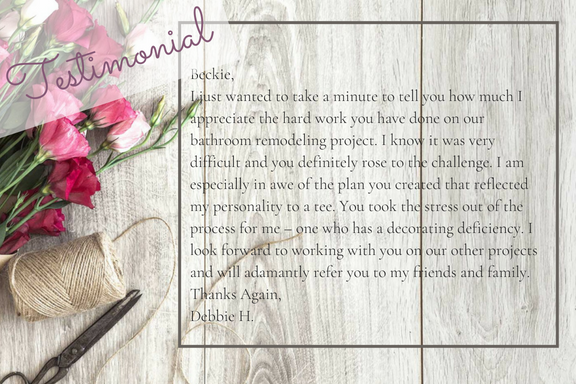 Since this, along with your floor plan is such an integral part of your planning process, I include a furniture space with all of my floor plan packages. WOW! That's a lot of value! By having this plan in your hands, it is much easier to find your perfect pieces of furniture for your home. You will easily be able to zero in on the right size, style, color and quantity that you need, because you will have specific guidelines to work from. Putting careful thought and planning into this layer is crucial to saving money and preventing mistakes when furnishing your home. Lighting is one of the most important elements in a good design plan. It is said that "It doesn't matter how great your design is; if you can't see it, it isn't successful." Before you hire an electrician to hard wire your room or even purchase a fixture, there are many things to consider and questions to answer. What activities will take place in this space. How to determine the amount of light you need based on the volume of space you have. How far apart to space your fixtures. What kind of lighting effects you want to create within your space. Are there different types of situations you need to plan for? Are there safety concerns that can be solved with a lighting solution? These are just a few of the issues that will need to be addressed to achieve a well-lit home. Window treatments are only limited by your imagination. Anything you can dream up can be created. They are, however, quite an investment since a lot of fabric is usually involved. There are also a lot of parts, pieces and measurements to be included, so it is crucial that it gets done right the first time. This is a layer that has a few sub-layers. Knowing what they are, and what your options are, can be very helpful in creating a properly dressed window. This is the fun part of any design, and the one that people tend to jump to first, even though it is last on your to-do list. This layer will bring out your personality like a shining star. It is actually putting your personal stamp on your home so that it feels like you. In this layer you will choose things like rugs, plants, art, and other decor items. Adding your personal history or any collections you may have also helps to make this space uniquely yours. Experiment with displaying them in creative and beautiful ways. It is my goal to point you in the right direction on your journey to creating a beautiful, creative home for your family. It should be a place where you feel comfortable with friends and family, a place where you can grow and make memories. It is my mission to help you love your house, so that you have a place to call HOME.